Here is my story for Barbara Beacham’s Mondays Finish the Story. We get a photo and an opening sentence, which is in bold in my story. To read all the other contributions, click on the blue froggy. I’m not sure what my story is supposed to be. Horror? Comedy? Comedy horror? It made me laugh :-). 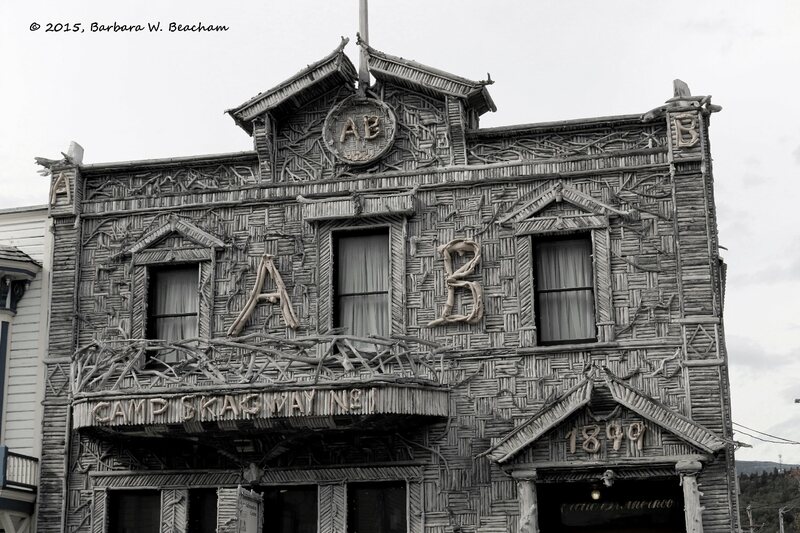 The A&B Building was made entirely from driftwood. But no-one in the sleepy town of Little Stickle would ever know the hideous truth. The sudden appearance of the building one morning had been quite a surprise! The residents were cautiously excited. The construction crew had horrible, blood-spattered flashbacks. Also in the news that morning was the strange disappearance of a visiting 100-piece Country and Western ensemble. The townsfolk loved their Country and Western, and almost all had turned up to listen. What a disappointment they were! The construction crew had thrown bottles and gotten terribly, terribly drunk. The police had shaken their heads. In the morning, there the new house was. The residents wondered why it smelled faintly of dead animal. The construction crew wondered what the sticky red substance on their tools was. The police wondered what had happened to the rubbish Country and Western band “Driftwood”. Don’t trash my country music! Brad Paisley … a great man! If you want, I will send you some song titles to Google! You will love him! I like country music! But the residents weren’t keen on “Driftwood”, I don’t think they were very good. The repetition of what the residents, construction crew, and police do — three times, no less — gives this a wonderful fairy tale / storyteller feel. Which goes nicely with the supernatural horror aspect — well done! Thanks! I rewrote those sentences a few times to try to get the same feel to each set. You are here. That is a pretty tough audience. It is! I wouldn’t want to try my luck with them. This is a great story. Just creepy enough to make the hairs on the back of your neck stand up. Yikes! A dark story well written. LOL! I think they might have found the country and western band! And, I think that building’s smell is going to get even more putrid! Great story Ali! A few hot sunny days and the truth will out, I think! ha ha . It’s really funny if you try not to imagine the red gooey stuff . Nicely done. What an end! Macabre. But fun. Loved this take on the prompt. “Macabre” is a good word for this genre. I’m glad you enjoyed it! A dark comedy highlighting reality. Disturbing and entertaining! Ooh, that’s dark. Still, Country and Western’s not my favorite genre. How bad WERE they? They must have been downright offensive. Well, you sure did make sure they were punished for their sins! Wait, did I just read that you like country music? Ha, I just said something similar (Blues Brothers-wise) in response to Marilyn! I like that – “disturbingly fun” :-). I’m glad you liked it! Yes, usually they just get booed and not asked back! I left a comment….did it I do it right? Yes. There was something a bit weird about this post – links not working for some people and so on. It’s slowly sorting itself out, I think! I would be so ticked that my tools were used, ha. A workman’s tools are sacred.